1) What made you return to art after a thirteen year gap? It was totally unplanned. In late 2013, I sustained physical and psychological trauma, which took most of 2014 to get grips with and eventually overcome. And it was painting that got me out of darkness - not prescribed medication for this, that and the other. Yet again, the proof of one’s own inner healing power of mind over matter and where art played its part for me. But I have to admit that I had to dig very deep to find that light and strength. In practice, it meant deep focus on visual images from my own photographs of trees, scenery, wildlife and imagination. Nature & wildlife, meditation & contemplation have always gone hand in hand for me, relating to health in mind, body and spirit. And when that flow and interchange is disrupted for too long period of time, something gives way leading to personal disaster! And before anyone asks, yes, there are always inner warnings – however such is the way of the world, you can’t always have your way and can get entangled in affairs that can drag you down and damage you. In the end, you just have to accept what’s happened and move on. So, in the effort of trying to find my way out of hell, paintings piled up and in wonder of what the future held, I thought of pursuing art as a side trade. I hope they give people the same joy and ‘escapism’ they gave me. 2) Would you say your personal life experiences directly influence the kind of art which you create? Very much so. All artists are influenced that way. But I think, I’m more prone. In time to come and as people get to know more of my work, past and present, the volume of work and how it’s changed will become very clear. A piece of art, especially a painting gets its true merit or ‘meaning’ once an audience learns who the artist is and what he’s about, and then where the work came from. That’s the only reason why I decided to share what I said above. Paintings like “Yellow Canopy” (featured in Sep 2014 exhibition with New Artist Fair) “Autumn Vision” and “Autumn Leaves” sprung out of my deepest despair. It has only been six months since my last exhibition, which was also my very first formal exhibition and I have to accept that it will take time. Art is a long road, especially for painters. 3) What genre best describes the kind of work which you create? Illustrative & impressionist, taking inspiration from nature, wildlife, mythology and spirituality. However, I go through periods where I’m more focused onto one theme. At present, I’m hooked on nature and wildlife within my ‘illustrative & impressionist’ style. 4) How do you decide which Art Fair you are going to participate in? Location of the event, the cost of getting there alongside the cost of the actual event and then how much wall space you can have. 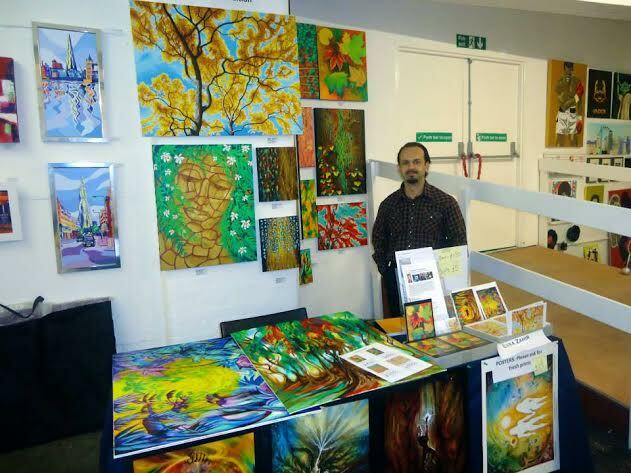 At present, New Artist Fair is the best deal for me within the greater London area. I’ve come to find them very helpful and accommodating and as a ‘late starter’ with restricted resources, I doubt I could even get a start without their help and presence. And I will be exhibiting with them for some time to come as well as provide works for their online shop. 5) Which artist either historically or current, have influenced you the most? There have been many. 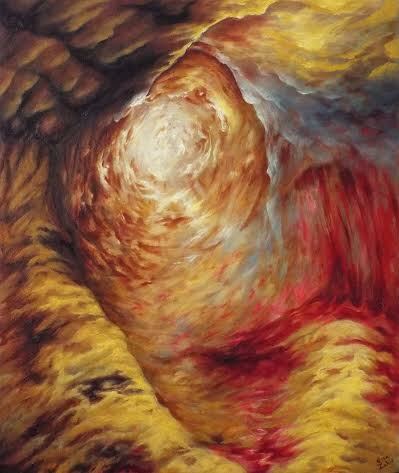 In the past, William Turner, William Blake and gothic art influenced me in the development of my work in the 1990’s, associated with “The Cosmological Warrior” published and unpublished art & literary works. But Vincent Van Gogh and James Dickson Innes were also big influences. I take inspiration and ‘energy’ from all art and artists. The work I produce does sway as I ingest what I’ve picked up – but eventually, the paintings find themselves and I think trained eyes are able to see what’s ‘Essa Zahir’ in my very contrasting works – hope so anyway! 6) What are you planning to exhibit at the New Artist Fair in March 2015? New works alongside past works from the 1990’s, which I will refer to as “The Abandoned Warrior”. New works will feature scenic themes with ‘solar light & energy’ such as “Solar Field” and “Birch Storm”. They will include wild animals and my take as an ‘animal impressionist’ on some of my favourite beasts, such as wild boar and Lynx on paintings such as “Swamp Hog” and “Lynx Snake”. I’m a huge cat lover, especially the more elusive and mysterious wild cats, which feature heavily in my work. And if you are a cat lover, stay in touch – I will approach the ‘spirit of the cat’ from my own angle as with other wild beasts. From “The Abandoned Warrior” there will be “Beyond The Realm” featured as my interview picture amongst others. I have a feeling buyer will be making very good investments, especially at the humble prices they will be going for. I would like to emphasise that I’m trying to find homes for my older works, which are special and unique, rather than aim to make money out of them. And on the subject, I’d like to add that all the works I will be exhibiting will be at lower costs than what appears on my personal website, exclusively for the duration of the event. To research my works on “The Abandoned Warrior” click on the relative links below. “The Abandoned Warrior” free download document will give detailed description on all the paintings and where they sat in the story and project I abandoned in 2001. You can also contact me and ask for a PDF of the 30-page document, which may suit you better. And for more information on the subject, click on my 2014 interview with New Artist Fair, and if you have any questions or wish to see a particular painting displayed on my website at the exhibition, get in touch via my website. Find Essa Zahir's work for sale on our shop page as well.